I was disappointed by the governor’s veto of Senate Bill 305. The bill was a preventative measure to secure Alaska’s finances by de-coupling our oil and natural gas taxes. Under current law, with the start of Transcanada’s “Open Season”, Alaska could be locked into a tax structure that costs our state billions of dollars in lost revenue. Estimates suggest that Alaska could lose-out on all our revenue from natural gas production, and up to 1/3 of our oil revenue. At this point legislative action on this issue has ended. While it’s unfortunate the bill was not signed into law, the legislature now has better understanding of the complexities we’ll need to tackle during future tax decisions for developing our natural gas resources. I’m confident that fixing this anomaly in our tax structure will remain a top priority when fiscal terms for the pipeline are submitted to the legislature. I enjoyed visiting Ketchikan today to talk with local leaders and speak at the Chamber of Commerce. I was glad to update folks about the progress we made on Southeast issues during session. While in town I also attended the ground breaking for the Pioneer Heights Senior Housing project. 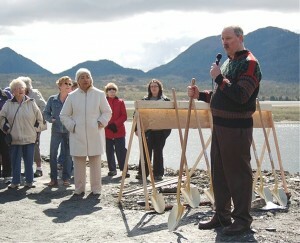 This will be an asset for Ketchikan’s seniors, and I’d like to thank Ed Zastrow for his leadership on this project. Here’s some information on the accomplishments of the Bi-Partisan Working Group during this session. The Legislature has sent legislation to the Governor that will protect our state’s finances by separating oil and natural gas taxes. Senate Bill 305 secures Alaska’s fiscal position in preparation for development of our natural gas resources. Under current law, Alaska’s oil and natural gas are taxed at one rate based on their combined value. After extensive review, the legislature identified a structural flaw in this tax that could have major repercussions. The results of our review were alarming. Economic models showed that when oil prices are high and natural gas prices are low, as they are currently, the state could lose a huge amount of revenue. Once gas begins to flow through the pipeline, low gas prices could dilute state revenue costing us as much as $2 billion annually. In other words, since the value of these resources is linked, Alaska would be getting no money for its gas and even less money for its oil. Our state would have less revenue with a gas pipeline, than without it. This scenario is completely unacceptable. When TransCanada begins their “open season” on April 30, the Alaska Gasline Inducement Act (AGIA) will lock-in our current gas tax rates for the first ten years of production. Failing to fix this error in the tax structure could dilute our oil revenue stream, creating economic instability and financial uncertainty for partners looking to invest in our natural gas pipeline project. I worked with colleagues to pass a de-coupling bill that will address this issue. With the beginning of the Open Season just days away, the Governor must act immediately to de-couple our oil and gas taxes and to protect Alaska’s long-term financial interests. I’m pleased the legislature transmitted the bill in a timely manner, and I look forward to seeing the measure become law. I addressed the Sitka Chamber of Commerce today to wrap-up the legislative session and highlight our work on behalf of Southeast. It was great to be back home in the district. I enjoyed the opportunity to talk with Sitkans about issues facing our region and appreciated the questions from local leaders. The legislature has passed legislation naming public works in Petersburg after two well known citizens. On the recommendation of the City of Petersburg, I was proud to introduce these bills to recognize Alaskans who have made a contribution to their community and our region. Senate Bill 24 names the bridge over Hammer Slough after Louis Miller. Arriving in Petersburg in 1901, Miller worked as a carpenter for town founder Peter Buschmann. He constructed some of the first houses on Hammer Slough and oversaw construction of the Sons of Norway Hall. Senate Bill 25 names the South Mitkof Island Ferry Terminal after Richard ‘Dewey’ Duvall. “Dewey”, as he was known to friends, was a longtime resident of Petersburg and was instrumental in the founding of the Inter-Island Ferry Authority (IFA). He served on the IFA board of directors for 10 years, and worked at the South Mitkof terminal until his passing last fall. It is important to recognize Alaskans who give of themselves to make a difference in our state, and I’m pleased the legislature passed these bills.